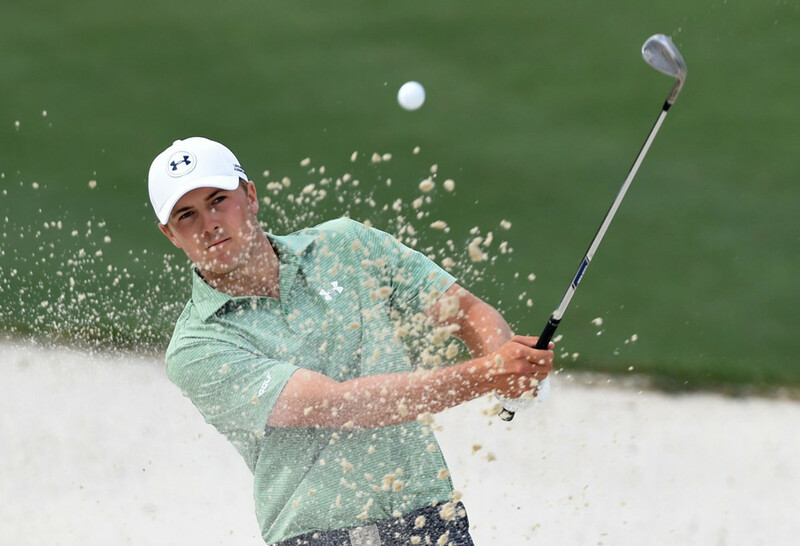 The 2015 AT&T Pebble Beach National Pro-Am is a fantastic event for golf fans and daily fantasy players. Pebble Beach Golf Links is one of the most popular public courses in the United States, and it often features dramatic shots with gorgeous views along the Pacific Ocean. Plus, viewers are often familiar with Pebble from either watching a previous U.S. Open or playing it on EA Sports’ Tiger Woods PGA Tour video game. But not only is it fun for daily fantasy players to watch, it’s unique when it comes to setting lineups. Why? The AT&T uses the same format as the Humana Challenge, which means three different courses (Pebble, Spyglass Hill Golf Course, Monterey Peninsula Country Club) are used over the first three days, and the cut is applied after Saturday’s round. The players who make the cut will play the final round at Pebble. So, before we get into the strategy, let’s take a look at the three courses. Luckily for us, there isn’t much of a difference in these three courses when it comes to length and par 5s. Pebble plays at 7,040 yards, is a par 72 and has four par 5s. No. 2 is reachable for everyone (511 yards) and actually plays as a par 4 at the U.S. Open. No. 6 is also reachable for most players at 506 yards, although it’s much more difficult with a severe second shot uphill along the coast. Very few players will go for No. 14 in two at 572 yards with a small severely-breaking green up top. No. 18 can be reached in two by the longer hitters at 543 yards, which is the dramatic finishing hole along the ocean. No. 4 is also a drivable par 4 at 326 yards with a long and narrow green. Over the 36 holes in 2014, which featured some rough weather, 14 eagles were recorded at Pebble. In 2013, 25 eagles were posted. Spyglass is 6,960 yards and is also a par 72 with four par 5s. All four par 5s (No. 1 – 595 yards, No. 7 – 529 yards, No. 11 – 528 yards and No. 14 – 560 yards) are reachable in two, but No. 7 and No. 11 are certainly the most reachable. Of the 15 eagles converted last year, 13 came on those two holes. No. 17 is a 325-yard par 4 that can be hit off the tee from the long-ball hitters too. Monterey Peninsula tips out at 6,873 yards, is a par 71 and only has three par 5s. No. 6 is 548 yards, No. 10 is 544 yards No. 12 is 599 yards. Nine eagles were recorded last year and 10 were converted in 2013 with one of those coming on a long hole-out on No. 13. With this information, there are two things we need to take into account. First, we still want to target the big hitters for more eagles and birdies. Second, we don’t have to use quite as much of a balanced-salary method. You are guaranteed 54 holes for your entire lineup unless someone withdraws or is disqualified. As for odds per dollar, as you can see on our PGA odds tab, DraftKings did a really good job this week with the top level and mid-level salary players. There are a few we can pick out who are cheaper and have a slight advantage. We will use driving distance, birdie or better percentage and strokes gained total (another statistic the PGA keeps track of we think is beneficial) to help us with our lineups. 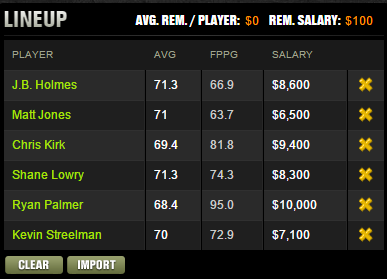 Just like last week, I’ll give you one of a few lineups I’ll use for the tournament with some minor tweaks. Remember, try and use all your salary or as much as you possibly can to fit the criteria listed above. Good luck! J.B. Holmes – One of the longer hitters on Tour, he’s reasonable on the odds per dollar page and nearly won last week at the Farmers Insurance Open. Matt Jones – Jones is a high-variance player who can go really deep when he’s on a roll. Statistically, he’s not as high up on the charts in 2015 for driving distance and birdie or better percentage compared to 2014, but he is one of the best in the game at converting eagles. Chris Kirk – He’s tied for 17th in birdie or better percentage, and he’s made the cut at every event this season. Shane Lowry – Lowry is 18th in strokes gained total and coming off a tie for seventh at the Farmers. He’s decently ranked for birdie or better percentage as well. 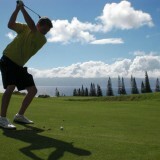 Ryan Palmer – Definitely my top play. Palmer is one of the longest hitters on Tour and is well priced for how often he makes birdies and eagles. Kevin Streelman – He’s made his last seven cuts, has already made four eagles this season and is very well priced with odds per dollar. DraftKings is running the $100,000 3-Wood for the Pebble Beach Pro-Am, a $300 to enter tournament that awards $20,000 for first place. Sign up for a DraftKings account through this link to receive a 100% deposit bonus up to $600 on your first deposit!